Lucina is the future daughter of Chrom who made her debut as one of the main characters in Fire Emblem Awakening and appears as a newcomer playable character in Super Smash Bros. for Nintendo 3DS / Wii U, revealed in the same trailer as Robin, another character from Fire Emblem Awakening. In her game of origin, she initially appears disguised as a masked "Marth", having traveled through time to stop the awakening of the evil Fell Dragon Grima, helping Chrom's Shepherds on occasion and eventually joining them after revealing her identity. 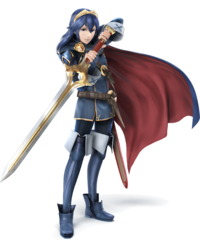 Lucina wields the Parallel Falchion, a reforged version of the same sword used by Marth and Chrom. Warps onto the stage from a magic circle. Lucina is an unlockable character in both Super Smash Bros. for Nintendo 3DS and Super Smash Bros. for Wii U. To unlock her in the Nintendo 3DS version, the player must either complete Classic Mode as Marth without the use of continues or play 40 Smash matches, then defeat her in a 1-stock match on the Arena Ferox stage. In the Wii U version, the player can unlock her by completing Classic Mode on Intensity 5.5 or higher or by playing 30 Smash matches, then defeating her in a 1-stock match on the Coliseum stage. She is voiced by Yū Kobayashi in the Japanese versions of the games, and by Laura Bailey in the English versions, both reprising their roles from Fire Emblem Awakening. She was originally meant to be an alternative costume for Marth, but was later made a separate character, the reason being that she has traits that differentiate her from Marth. Lucina is the only unlockable character that was announced before the Japanese release of the Nintendo 3DS version. Lucina's moves are all shared with Marth, including her custom variants: her standard special is Shield Breaker, her up special is Dolphin Slash, her side special is Dancing Blade, her down special is Counter, and her Final Smash is Critical Hit. However, while Marth's sword delivers more damage near the tip of the blade, Lucina's is balanced throughout. Lucina's palette swaps are based on other female characters in Fire Emblem Awakening. In addition, one of her taunts has her briefly put on the mask she wears when disguised as "Marth", which is also used by Kirby when she is copied by him. Finally, Lucina has alternate victory quotes that have a chance of playing if she defeats either Marth or Ike. Lucina returns as an unlockable playable character in Super Smash Bros. Ultimate. This time, she is classified as an Echo Fighter of Marth (i.e., they play quite similarly). Lucina's victory theme is now a short arrangement of "Id (Purpose)", a song from Fire Emblem Awakening. Lucina benefits from universal changes: her mobility is faster, her short hop timing is reduced, the landing lag in her aerials is reduced, she can directionally air dodge, and she can use any ground attack out of a run and any aerial attack on a ladder. Shield Breaker is Lucina's standard special move. 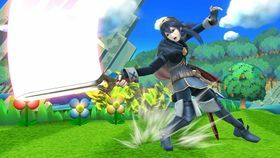 By holding the special button, Lucina charges up an attack with her sword that deals high damage and, as the name states, is capable of breaking opponents' shields at full charge. 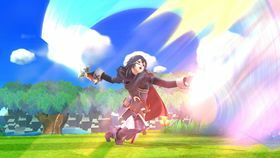 In addition, unlike most charge attacks, Lucina automatically unleashes the attack when fully charged, rather than saving the attack for later, and can also be automatically performed by releasing the special button at any point during charging. Lucina can also turn around while charging by tilting the control stick in the opposite direction soon after starting to charge the attack, though unlike most moves this does not increase the move's damage output. In Super Smash Bros. for Nintendo 3DS / Wii U, the Shield Breaker's first custom variant is Storm Thrust, which deals less damage than the normal Shield Breaker but creates a gust of wind that blows opponents away, the size of the gust also depending on how much the attack is charged. The second custom variant is Dashing Assault, which like Storm Thrust does not deal as much damage as normal, but Lucina charges forward when attacking, allowing her to strike multiple opponents more easily; the distance she moves forward is also determined by how much the attack is charged. Dancing Blade is Lucina's side special move. 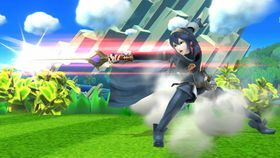 Lucina deals a sword slash combo that can be executed by pressing the special move button; the full combo consists of four hits. In addition, certain portions of the attack also differ depending on the direction the player tilts on the control stick; the second hit has an up and forward variation, and the third and fourth have up, down, and forward variants, which deal higher knockback and damage. Dolphin Slash is Lucina's up special move. 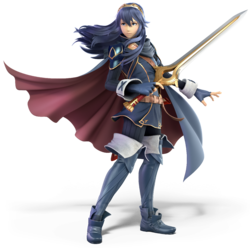 Lucina quickly leaps up into the air and slashes her sword directly up, damaging any nearby opponents. The attack deals the most damage at the beginning. Counter is the down special move used by Lucina as well as Marth, Roy and Ike. The move is based on the combat of the Fire Emblem series; when one unit attacks another unit, the opposing unit counterattacks afterwards. When used, Lucina enters a readied stance and automatically counterattacks whenever attacked, reflecting all damage and knockback back onto the opponent. It operates identically to Marth's Counter, dealing 1.1 times the damage of the opponent's attack. In Super Smash Bros. for Nintendo 3DS / Wii U, the first custom variant for Lucina's Counter is Easy Counter, which has a longer window for counterattacking but deals less damage. The second variant is Iai Counter (known as Rush Counter in the PAL release), which deals a faster attack that sends the opponent flying behind the player, but does not deal as much damage. Critical Hit is the Final Smash used by Lucina as well as Marth and Roy, based upon the critical hit mechanic of the Fire Emblem series. Functioning identical to Marth's Critical Hit, Lucina charges directly forward, striking any opponents in her path and dealing high damage and knockback. A health bar designed after the ones from Fire Emblem Awakening also appears for each character struck by the attack that completely depletes. 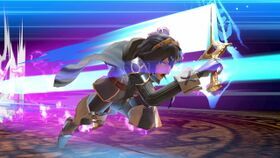 When used on the ground, Lucina charges to the end of the platform on which she is standing. 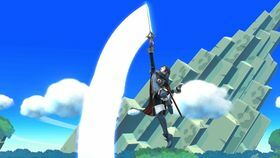 When used in the air, Lucina only moves a certain distance forward before the Final Smash automatically ends. The player can also press either attack button to execute the sword slash at any point while flying forward, ending the attack then. Lucina appears as a Costume Mario costume in Super Mario Maker. Her costume can be unlocked either by using her amiibo, or by completing 100 Mario Challenge on Expert difficulty or higher. Like the other Fire Emblem series character costumes, Lucina uses sound effects from Fire Emblem: Shadow Dragon and the Blade of Light. Pressing causes her to put her mask on. (3DS) N/A NA: Chrom's daughter and the future Princess of Ylisse. When she arrives from a doomed future seeking to prevent it from ever happening, she goes by the name Marth before her identity is revealed. She fights much like her adopted namesake, but more than just the tip of her sword is powerful. (Wii U) 3DS Fire Emblem Awakening (02/2013) NA: Chrom's daughter and the future Princess of Ylisse. When she arrives from a doomed future seeking to prevent it from ever happening, she goes by the name Marth before her identity is revealed. She fights much like her adopted namesake, but her entire blade is equally powerful instead of having a more powerful tip. (3DS) N/A NA: Lucina's moves are much like Marth's but there are subtle differences. With Marth, you need to try to hit with the tip of his sword, but Lucina's sword is equally powerful all along the blade. Her Shield Breaker move lets her attack opponents and break their shields at the same time. Charge it to fully shatter a shield in one hit. Like with her official appearance, Lucina's in-game model features the Mark of Naga on her left eye. Masahiro Sakurai has said that, as it is such a small detail, most players likely will not notice it during normal gameplay. This page was last edited on April 5, 2019, at 08:03.